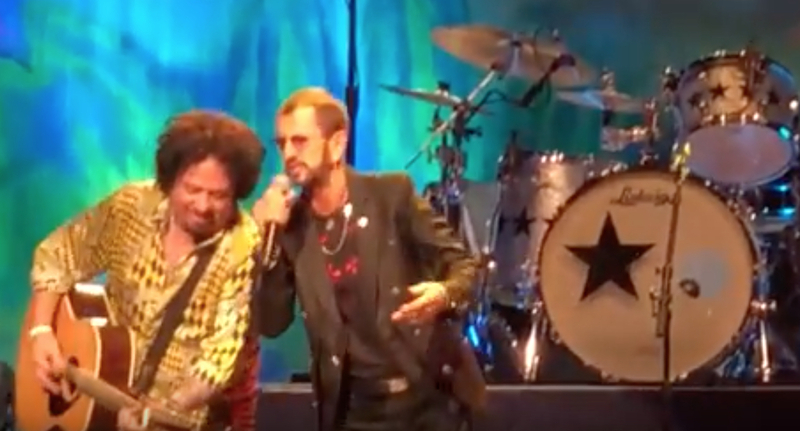 Ringo Starr has led his All-Starr Band for years, with a collection of stars–or at least individual members of some of classic rock’s top bands–taking part in the revolving lineup. So when the 2018 edition was announced, the names piqued interest. Coming back from last year were 2x Rock Hall inductee (Santana, Journey) Gregg Rolie on keyboards and guitarist Steve Lukather (a founding member of Toto and a performer on countless recordings for others). New for 2018 was Colin Hay (of ’80s Australian export Men at Work) and Graham Gouldman (a co-founder of 10cc and songwriter of British Invasion hits for the Hollies, the Yardbirds and Herman’s Hermits). The result? With outstanding contributions from multi-instrumentalist/vocalist Warren Ham and drummer Gregg Bissonette, the All-Starr Band’s performance at New York’s magnificent Radio City Music Hall on Thursday night (September 13) was as exuberant and polished a concert as an audience could hope for. The beloved, 78-year-old Starr sings half of the songs on the 24-song set, mostly from the front of the stage. And he happily sits behind his drum kit–with the familiar Ludwig logo, emblazoned with a star (get it? )–performing as one of the guys, on the songs led by the All-Starrs. Early on, Ringo introduced the Beatles’ “What Goes On” as the “only song written by Lennon, McCartney and Starkey”–who knew?–and the audience offered its lusty approval. For this tour, each of the four All-Starrs gets to lead the band on three of their familiar hits. Rolie’s songs were all ones that he performed with Santana, including “Black Magic Woman.” This edition featured an extended jam with a super drum solo by Bissonette and was one of the evening’s highlights. Another highlight this evening was the Lukather-led “Africa,” a #1 hit for Toto in 1983 (and a surprise #1 Alternative hit this year when it was covered by Weezer, after a fan urged them via social media to do so). 2018 has been quite a year for Starr. On March 20, he was knighted in a ceremony at London’s Buckingham Palace. The evening ended with one of his best-loved performances. Eh… I really respect Colin Hay, who has had a wonderul, albeit low-key, solo career post-Men at Work. Gregg Rolie, of course, was a vital part of early Santana (I’ll try to not hold for’ong Journey against him) so he gets a pass too… But the rest of these “All-Starrs”? Meh. I’ve never understood Toto’s appeal at all (“Africa” being revived as some kitschy “classic” is ridiculous) so Lukather does nothing for me. I recognize Gouldman’s name froma number great old 60s tunes, but 10cc is every bit as lightweight as Toto. And who are these other guys, Ham and Bissonette? Never heard of them until ads for this tour started appearing. I know it’s not 1989 any more, but I saw that very first Ringo “All-Starr” tour. Now THAT was a band! Ringo (duh) along with Levon Helm and Rick Danko from The Band, Dr. John, Joe Walsh, Billy Preston, Clarence Clemons and Nils Lofgren from the E Street Band, and the great session drummer Jim Keltner. Sorry, but this current band just doesn’t come close to that! Hell, I also saw Ringo’s second tour a few years later and that one was almost as good: Walsh and Lofgren again, along with Dave Edmunds,Todd Rundgren, Burton Cummings, Timothy Schmitt, and Ringo’s son Zak on drums. There was some other generic dude playing sax, I forget his name. He sang some lame song, but his playing as OK. Wasn’t as good as ‘89, but not bad. Anyhow, you gotta love Ringo but each tour since that first one has gotten worse and worse in terms of the “All-Starrs” joining him. And it’s not like Ringo himself is bringing much of anything new to the table each time. Maybe one or two new songs, but mostly the same Beatles and early solo hits. Bissonette is a studio drummer who has played on a lot of sessions. Great player, but not a “household name” most people would recognize. Have no clue who Ham is, at all. But you are right, Guy…..the “star power” has diminished a bit. Especially in the guitar department. And a shake-up of the song lineup may be a good idea, too. If you think all Toto is Africa you don’t know Toto. Steve Lukather, founding member of TOTO, is considered by many as one of the greatest guitarists alive, if not, for all time. Listen to TOTO’s 1993 album Kingdom Of Desire and watch him play live on TOTO’s 25th Anniversary Live in Amsterdam DVD or the Falling In Between Live DVD, and you’ll probably change your mind. No argument with seeing Lukather, here. But with guitar being the most common instrument in rock, you would think there would be a second quality guitarist to be Lukather’s “foil”, so to speak. There had been, in the past, some great multiple guitar matchups on Ringo’s All-Starr tours. Ringo, however, has more than earn the right to do whatever he pleases. We may not agree with his choices, however.